Note: This review refers to the paper edition, not the ebook. Reading the Annotated Pride & Prejudice is like reading Pride and Prejudice with an English professor whispering in your ear. And like all professors, this one generously shares both interesting information about the story structure and historical background and some irritating explanations (“when Jane Austen says this, she means this…” to which my inner student replies, “yes, yes, I know, but Jane said it much better”). I liked having the text on the left page and the commentary on the right page. No need to flip to the back to read the notes, hence no crushing disappointment when the note turned out to be an eye-roller because the interruption in the text was minimal. Did I learn much from it? Hard to say, but yes, probably. On the one hand, I have read Pride and Prejudice so often that I can recite pages and pages of it on demand, so I didn’t need most of the commentary. 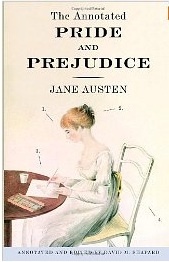 But I did enjoy the close reading of the story structure that the notes provided and the citations that linked aspects of the novel to what Jane Austen wrote about it in her letters. Shapard has also released annotated versions of Persuasion, Sense & Sensibility, and Emma, and as a Jane Austen nut, you can be sure I’ll be checking them out.